The spread of the H7N9 virus among poultry in live bird markets (LBM) in China's Guangxi Province has significantly increased the risk that it will progressively spread to other neighbouring countries of China, posing an increased human health risk, the United Nation's Food and Agriculture Organization (FAO) warned last week. The virus, which produces no detectable symptoms among infected birds, has seriously disrupted poultry production and markets in 14 provinces of China, and Hong Kong SAR and Taiwan Province of China. It has resulted in at least 290 confirmed illnesses with 66 human deaths from animal-to-human transmission. There is no evidence of human-to-human transmission with many human cases being linked to poultry exposure at live bird markets (LBM). Authorities in China have tracked movement of the infection to live bird markets in Guangxi between January 24 and 28, 2014, where the province's first human casualty was also reported. Guangxi Province shares a border with Vietnam while its neighbouring province, Yunnan, shares borders with Myanmar, Lao People's Democratic Republic and Vietnam. FAO has been working closely with Vietnam's Department of Animal Health, Ministry of Agriculture and Rural Development, to support H7N9 surveillance in more than 60 LBMs in northern provinces of the country since June 2013. So far, there is no evidence that the virus is present in Vietnam or any of China's other neighbouring countries in Southeast Asia. But there are indications, based on previous experience with the H5N1 virus, that H7N9 could circulate across borders. Given the the way poultry moves between China and neighbouring countries, and in addition to the economic losses suffered by an outbreak, H7N9 presents a serious public health risk when there is close contact between infected poultry and humans, particularly during times of festival such as the recent lunar new year celebrations. 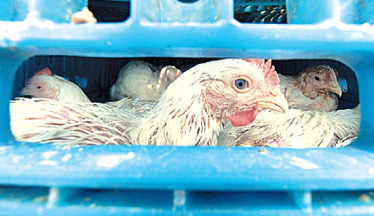 The lack of any visible symptoms among infected birds makes early detection more challenging. Therefore, it is critical that all of China's neighbouring countries in the sub-region review their emergency preparedness and response plans to effectively address outbreaks of H7N9. "The key issues that need to be considered immediately are the enhancement of ongoing surveillance and a comprehensive risk communication plan to raise awareness of the threat H7N9 poses to animal and human health sectors," said FAO Assistant Director-General and Regional Representative for Asia and the Pacific, Hiroyuki Konuma. "Urgent initiatives are needed to improve biosecurity in live bird markets and a clear response plan to disrupt the transmission cycle of the virus in case of an incursion, is also necessary."